The Bayview Yacht Club in Detroit, Mich., is launching a new event this summer: the Bayview One Design Regatta. Scheduled for May 31 through June 3, 2012, the inaugural event offers a long weekend of racing on Lake St. Clair for all types and sizes of boats and encourages sailors of all ages and calibers to participate. Even as Wisconsin weather forces their sailboats off Lake Michigan, Shorewood High School students Kate and Elizabeth Hayes hang onto their sailing lifestyle in any way possible. It involves adorning calculators and folders with sailing stickers, finding projects for their boats, analyzing YouTube sailing videos, talking strategy and reminiscing. "Sailing for me is not so much a sport; itâ€™s like a lifestyle," Kate said. Having been holed up in Holland Michigan since the 2000 Chicago Mackinac Race, Sayonara, Larry Ellisonâ€™s 80â€™ Maxi is headed home. Her destination, Pier 80 in San Francisco which is currently HQ for Oracle Racing and ground zero for all things Americas Cup on SF Bay until the construction of the new piers on the City Front are complete. 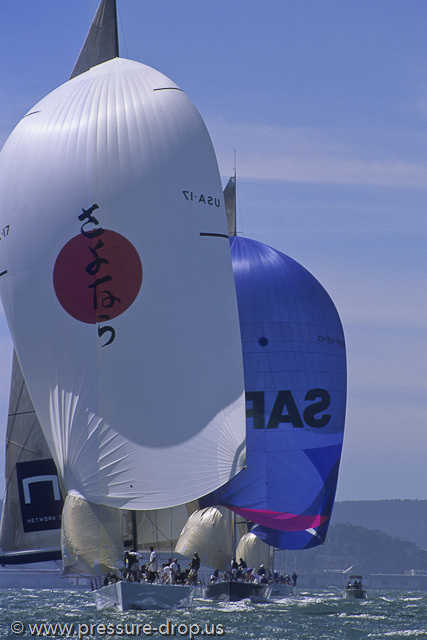 Sayonara was the launching pad for Larry Ellison into the yacht Racing World, his 1st foray into serious competition. The Audi Melges 20 fleet in the U.S.A. takes a second stab at holding its U.S. National Championship this weekend in sunny Miami, Florida, hosted by Coconut Grove Sailing Club (GCSC). More than thirty teams originating from three countries have arrived and have been thoroughly enjoying the brilliant Biscayne Bay conditions, in full anticipation of a nice, breezy forecast. IT CAN BE QUITE A SURPRISE to see how much safety gear there is aboard some sailboats, and how little aboard others. A lot of it has to do with the owner's philosophy. During the 1950s, when men such as Marcel Bardiaux and Bernard Moitessier were sailing around the world singlehanded, they spurned even such elementary safety features as stanchions and lifelines. "They give you a false sense of security," Moitessier once told me. "They catch you below the hip. They can catapult you overboard. Better to learn to cling like a monkey, like me." US Sailingâ€™s long-awaited report on the fatal Lake Michigan accident that took the lives of two Chicago-to-Mackinac race sailors in July was released today and, to no oneâ€™s surprise, it faults the boatâ€™s design for the tragedy. The report says that WingNuts, a Kiwi 35 sport boat with a very high amount of sail area relative to the boatâ€™s weight, wasnâ€™t suited to races as long and unpredictable as a Mackinac race. There are no better words to hear during the upwind leg than, "We are higher and we are faster". The combination of sailing higher and faster than the closest competitor is so powerful. Every team off the starting line is trying their hardest to sail high and fast to open up opportunities to tack or sail straight.